As we mentioned before, last weekend, we ventured off into Southern California to escape the pressures of midterms and looming, sugary protests. 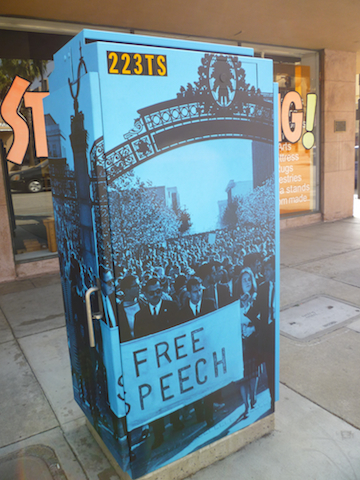 It just so happens that Berkeley, while physically 400 miles away, remained with us in spirit and … utility boxes. While heading to Old Town Pasadena for an evening of unspeakable debauchery, we just so happened to observe a bright blue box with a large photo of something that looked oddly familiar. Forgetting that this wasn’t Berkeley and we can’t do whatever the hell we want, we made a highly illegal U-turn and pulled up in front of the box. Lo and behold, Sather Gate stood right before our eyes. Happy 47th birthday, Free Speech Movement! 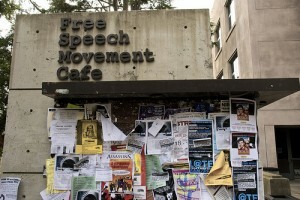 The first of this month marked the 47th anniversary of Berkeley’s very own Free Speech Movement. It started back in 1964 when a graduate student named Jack Weinberg declined to show his identification to campus police while sitting at a booth for the Congress of Racial Equality. As a consequence of his refusal, Weinberg was arrested, sparking the famous movement. Considering that you can’t walk through Sproul without being bombarded by the circus which has set up an almost permanent camp there, a lot of us manage to overlook a pretty grand piece of artwork: a 60, 000 foot tall sculpture. To be fair, it is sort of invisible. 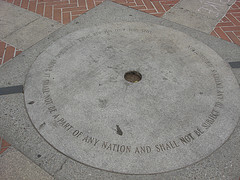 Built as a commemoration of the 25th anniversary of the Free Speech Movement, “The Column of Earth and Air” is a six-inch circle which proclaims complete freedom from any entity. The artist, Mark Brest van Kempen, entered his design into a competition started by the Berkeley Art Project in 1989. The group, knowing that the university didn’t really want something commemorating the Free Speech Movement, organized the contest outside of the university. Once the winner was chosen and the gift to be given, the university couldn’t exactly reject it. So, they graciously allowed the Berkeley Art Project to give them free artwork with one tiny condition: the Free Speech Movement not be mentioned anywhere in the press release. And so, with a beautiful irony, the university imbued the sculpture with so much more meaning than it would have possessed. British colloquialisms aside, (and yeah, we’re that pretentious) we Americans love our constitution, especially when it comes to the first amendment and our beloved free speech. Berkeley even named a whole darn cafe after it! 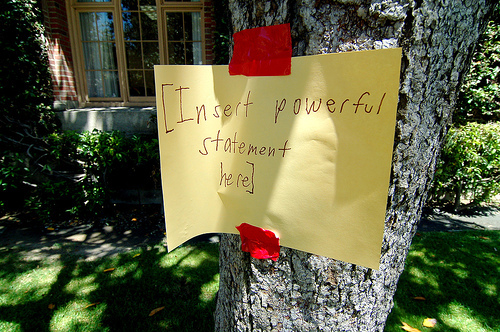 So it only follows that this Tuesday Sept. 14, from 6-8 p.m. at the Free Speech Movement Cafe (where else? ), emeritus history professor Leon Litwack will give a lecture on the Free Speech Movement and the Constitution. Having a Free Speech Movement discussion at the FSM seems a little too adorable, but you have to admit, this is still a very relevant issue. After all, what about that guy who wanted to go around burning Qu’rans? That certainly keeps the free speech debate current. It doesn’t hurt to brush up on your Berkeley history, either. The rest of the country just assumes we’re still hippies, so we might as well know a little something about it. That stereotype is kinda fun to perpetuate. In times like these, the unspoken wedding of “philosophy major” to “cardboard box” looms especially menacingly in your parents’ minds. However, in a triumphant response to pragmatic parental units everywhere, UC Berkeley honored Slusser Professor of Philosphy John Searle yesterday, its shining exemplar of what pro philosophers are made of, for his fifty years of instruction at UC Berkeley. 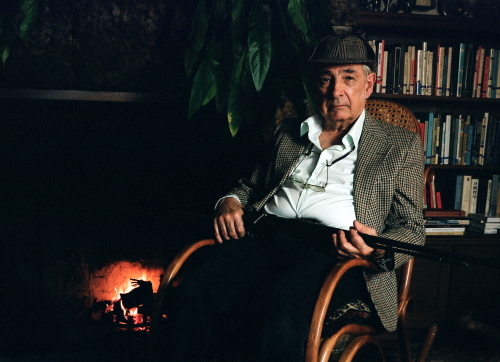 Tags:Free Speech Movement, John Searle, what is it like to be a bat? 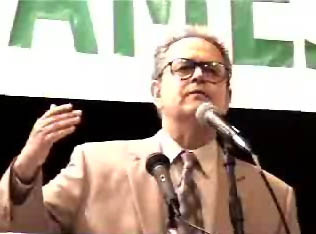 If the name doesn’t ring a bell, we’re talking about the third-party political activist who described himself as “a watermelon – red on the inside, green on the outside.” Peter Camejo helped found the California Green Party in 1991 and ran three times for governor of California.